Primary development of Aliens: Colonial Marines is TimeGate Studios work, according to ex-Gearbox employee. 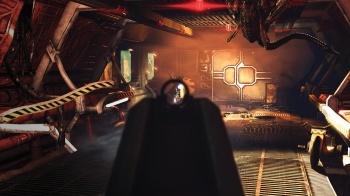 The long wait is over, and Aliens: Colonial Marines is out there, for better or worse; but who made it? One ex-Gearbox developer has cast doubt on its origins, claiming that the bulk of the game was TimeGate Studios' doing. "I used to work at Gearbox," says the anonymous developer, "and the development of that game has been a total train wreck, going on what, 6 years now? Gearbox isn't even making the game, except for the multiplayer. Primary development was outsourced to TimeGate Studios, which has a less than stellar past." The statement, first brought to the internet's attention by superannuation, was submitted by a developer who claimed to have left Gearbox to work for Armature Studios, a company put together by ex-Retro people. If true, it contradicts a previous statement by Randy Pitchford, who told Gamasutra that the game was 80% in-house. "I hope it proves me wrong," the source goes on to say, "as I still have a lot of friends still working at Gearbox, but I am expecting it to be average at best." Though it's early days yet, Aliens: Colonial Marines isn't having a happy time over at Metacritic, where the Metascore at time of writing is 50/100.